Mango cake is a real tasty one. I have made mango sponge cake and put together with whipped cream frosting and topped with Mango jelly and fresh fruits. As the mango season has started we can get mangoes in cheaper rates and it the perfect time to make this cake. Mango flavour dominates this cake and the cake is so moist. You could use fresh mangoes, tinned frozen mango puree also to make this cake. 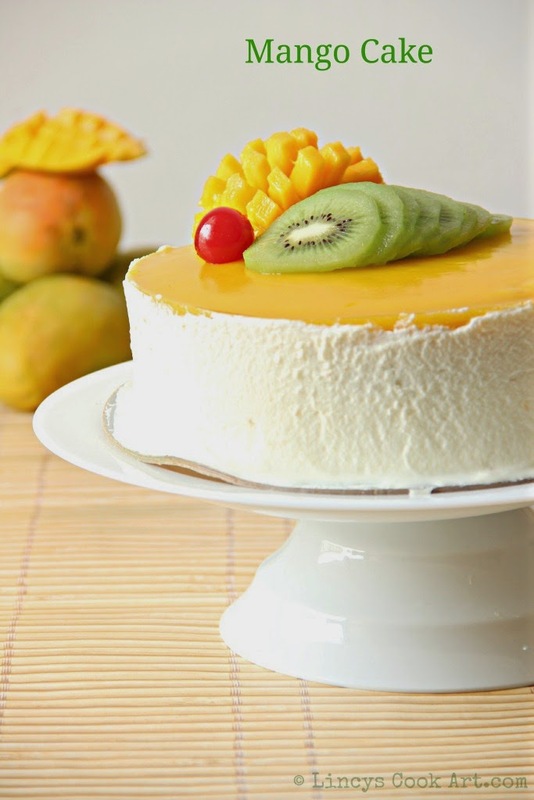 Adjust the sugar level according to the mangoes you use to make this cake. Top this cake with the fruits of your choice. I have made here egg less version. If you are planning to add eggs replace the yogurt with 2 eggs and proceed with the same instructions. Grease and flour the pans or line with wax paper. In blender puree the mangoes. In another bowl add melted butter and sugar and beat using a electric beater till the sugar dissolves. Now add the yogurt and beat till it forms lightly creamy. Add the mango puree and mix till combined. Now add the baking powder, baking soda and flour half a cup at a time and mix/ fold well until the the whole flour mix finishes. If you feel the batter is thick sprinkle little milk and mix well. Transfer the batter inside the prepared 18-20 cm two baking trays and level the top. Bake inside the preheated oven for about 30 -40 minutes or until the skewer inserted comes out clean. Unmould one of the cake and keep another cake inside the cake mould to set the mango jelly on top over the cake(set the jelly immediately inside the freezer as it may seeps down the cake) or spread a layer of icing on top and pour the jelly. Puree mango with sugar in a blender as a fine paste. Sprinkle gelatin over quarter cup of water in a thin layer till it finishes and allow to bloom inside the water. Once it double its volume melt this gelatin inside the oven till it dissolves around 30 seconds or cook on top of stove till dissolved. Add the gelatin mixture with mango puree and mix well with spoon and pour over on top of the one of the cakes inside the cake tin. You can also use by soaking china grass in water above mentioned and cook the china grass till dissolved and set the jelly. Now you will have a plain mango cake left with out jelly going to be used as the base or bottom layer of the cake. Chill the whisk, bowl and the whipping cream for about 15 minutes. Whip the cream by adding 2 teaspoons of sugar till you get the stiff peaks. Cover the bowl with cling film and refrigerate till you use it. Using pastry brush crumbs sticking over the cake. Keep a teaspoon of frosting on the cake board and keep the first cake. Apply 2-3 tablespoons of frosting and spread evenly on top of the cake. Keep the second cake and slightly press with hand. Keep the cake with mango jelly on top and finish the sides of the cake with the frosting. First apply a thin layer and chill for about 15 minutes and apply a thick layer. Garnish top of the cake with cut fruits of your choice mango pieces, kiwi, cherries ..etc as per you wish. Mango cake looks super yummm...... Lovely clicks Eliza ! Yummy way to use mangoes. Looks great. Cant wait to try it. Can we use canned mango puree (sweetened) instead? Any suggestions for what would be ratio or changes to the recipe in that case? I have mentioned only 1 cup of sugar as the mangoes has the sweetness in it. Sweetened mango pulp also you can use same quantity of sugar. If you really want to reduce sugar you can reduce a table spoon or two from a cup of sugar. I can't take my eyes off the cake. Looks fabulous! Looks very inviting; can I have a piece of cake?. Awesome clicks. Truly awesome Lincy....this cake looks so good ...loved your pics as always..
Cake looks so yummy nd color is wow... clicks are too awesome..
Lovely clicks, the cake looks beautiful and delicious..
Wow such a pretty cake, lovely texture. Looks super yumm ! Oh gosh, that cake is just simply out of world, makes me crazy..I want a super huge slice. That is one amazing mango cake dear, what cream you used for whipping? I used 'puck' whipping cream which is available in middle east countries. Hello Lincy , the cake just looks fabulous and yummy. I happened to come across this blog just a few days back. I am not into baking but have recently developed fondness for the same. I have a question ,the gelatin u have mentioned is it white gelatin powder? I have white gelatin powder,will it work? Yes it works. The yellow colour is from mango puree. Use any brand unflavoured gelatin/ China grass powder or strands to set the jelly. Oily taste may be because of the quality of oil u have used. U can also replace with butter not with ghee. Butter gives nice taste. As it is saturated fat i have replaced butter with oil. Use vegetable oil/ sunflower oil or corn oil for cakes. Pour the liquid jelly right after preparation on top of the cake just once. I have mentioned to crumb coat the cake with 'whipped cream frosting' as a thin layer then allow to set; then coat with a thick layer. Hi Lincy, how long would it take for the mango jelly to set? It takes half an hour to one hour as it is a thin layer. You can apply a layer a thin layer of icing to prevent the jelly seeping into the cake. Or even ice the whole cake well and make raised borders on top using the icing and pour the jelly at the middle of the cake and set it on fridge. What temperature is this baked at (in degrees Fahrenheit)? Hello Lincy, I am going to use eggs instead of yogurt so shall I add that all togather or one by one and as I am using eggs then I should add vanila extract or mango extract/essence right? If yes then how much? add the eggs one by one and beat well till frothy. If you wish add mango extract but it is not necessary for more flavour add the essence a teaspoon at the final stage. 180 degrees Celsius or Fahrenheit?